The judges are mostly kind to the delusional off, key, pitchy, tone deaf applicant, but then there are times when it’s too difficult to hold back their true feelings. They aren’t in the business of canning someone’s dreams or towing their hopes out of the realms of possibilities, just the realm of American Idol. Mostly a contestant will get the respect they deserve for simply having the nerve to audition. Even Carrie Underwood when asked if she was nervous said yes because she had to sing for Simon. Jennifer Lopez is born of Puerto Rican parents who preferred she do anything, anything else, but get into the entertainment business. And although J. Lo is still very front and center with her singing career, there’s so much more to this talented and respected businesswoman. Catapulting off of her singing chops, and good looks she has used her business sense very strategically. However, it wasn’t until 1999 that Jennifer recorded her debut studio album On the 6. Her first climb up the entertainment ladder started with acting. She made her lead acting debut playing Selena in the 1997 movie by the same name. She was a stand-out hit. She went on to play in the film Out of Sight and earned the distinction for being the first Latina to earn $1 million for her role. Having played in several recognizable movies after her initial debut there’s no doubt that her talents runneth over. Lopez has a fashion line that includes clothing, accessories and fragrances. She also has a production company. Jennifer is so much more than meets the eye – and that in itself should be enough, but she is considered the most influential Hispanic performer in the United States, worth billions. Keith Urban is the cutie petutie from down under of the country/pop world. While he comes across as all man, he can’t hide the kid-like persona that lurks below the surface. Keith made the scene as a country pop singer, songwriter initially in Australia. He has an eye for business and is a booming entrepreneur introducing his own signature line of guitars and accessories. Urban has released nine studio albums, and 18 of his 37 singles that charted went to number one. He knows his way around the judges panel having first judged the Australian version of The Voice before becoming one of our dreamiest American Idol judges. Harry Connick Jr. was born into a prominent New Orleans family in 1967. He dropped his first name of Joseph and has been known as Harry since he was a little guy. He knows his way around music, having learned the keyboard at the age of three and performing publicly by the time he was only five. He was recording with a local jazz band when he was ten and the year before that played with the Louisiana Philharmonic (known then as the New Orleans Symphony Orchestra) the Piano Concerto No3 Opus 37 of Beethoven. Harry knows his way around music! He’s had more number one jazz albums than any other jazz recording artist in history. Along with his three Grammys he’s also earned two Emmy awards. On top of all of his talent it’s been rumored that he’s got a wicked sense of humor. He’s fun to watch and taking his critiques to heart is about the best thing a contestant could do. 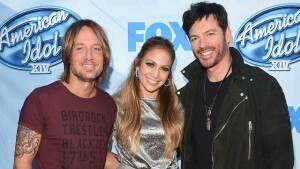 Looking ahead, I can hardly wait until January 6th to see my three favorite judges, but in the meantime, we American Idol Fans will wait patiently for what we know is going to be the best season yet.